Traveling on planes? Such a hassle. Not only are we relegated to 3 ounces or less of all beauty products -- totally difficult for any self-respecting beauty chick -- but now airlines are charging to check bags! And of course we're not even allowed to put chic makeup bags in our carryon bags -- we have to use those horrible gallon-size plastic bags. Ugh. Well, this beauty chick has found the answer to all your prayers. 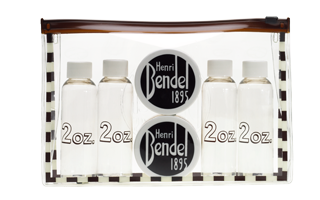 The Henri Bendel HB Clear Beauty Travel Case will not only let you circumvent the ugliness of a plastic Ziploc bag, but it comes with a variety of regulation-size containers and jars for you to tote all your favorite products! Organization will not only be a snap, it will keep you looking super-stylish whilst you wait in those insufferably long security lines. The durable clear vinyl case is -- of course -- accented with Bendel's signature brown and white striped trim. Inside you'll find two twist-cap jars and four bottles, each of which holds two ounces of liquids and creams. At $35 on Henri Bendel's website, it's a bit steep -- but with six containers, it's totally worth it. Airline travel has never been this easy. Oh my gosh, these are adorable! eye4style -- Aren't they? They're just so perfect for travel!